Nose Work with Carol Noriega, CNWI! K-9 Nose Work® is one of the fastest growing canine sports. 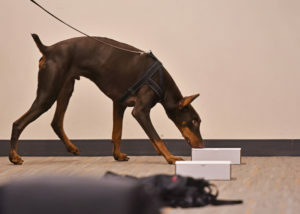 Developed in 2009, K-9 Nose Work® was modeled after the professional detection and search and rescue fields. Turn your dog’s natural instinct to explore and smell into a fun game of hide and seek, or take it to the next level and compete. Dogs LOVE this sport! NO obedience skills required – every dog and every owner can participate in this game! Introduction to K-9 Nose Work® is taught by Carol Noriega, a Certified Nose Work Instructor. Carol has been successfully teaching Nose Work since 2014 and is actively competing with her dogs. She is a member of the National Association of Canine Scent Work, an active host for NACSW trials, and an ORT judge and certifying official. Come on down and learn what all the buzz is about!